Montelukast is a Leukotriene Receptor Antagonist. The mechanism of action of montelukast is as a Leukotriene Receptor Antagonist. Montelukast Sulfone is an impurity of Montelukast Sodium. Tipelukast is a sulfidopeptide leukotriene receptor antagonist, an orally bioavailable anti-inflammatory agent and used for the treatment of asthma. 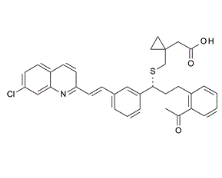 CP-105696 is a potent and selective Leukotriene B4 Receptor antagonist, with an IC50 of 8.42 nM. 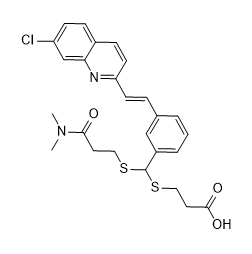 MK-571 is a selective, orally active CysLT1 receptor antagonist. It blocks the binding of LTD4, but not LTC4, to human and guinea pig lung membranes with Ki values of 0.22 nM and 2.1 nM, respectively. MK-571 attenuates kidney ischemia and reperfusion-induced airway hypersensitivity in rats. MK-571 alters bronchoalveolar lavage fluid proteome in a mouse asthma model. Etalocib, also known as LY293111 and VML295, is a novel diaryl ether carboxylic acid derivative, is a potent and selective inhibitor of the lipoxygenase pathway either directly through 5'-lipoxygenase or via antagonism of the leukotriene B4 (LTB4) receptor. YM-17690 is a novel non-analogous leukotriene agonist. Montelukast Methyl Ketone (Montelukast EP Impurity F; Montelukast USP Related Compound E; Montelukast Methylketone) is a Montelukast impurity. A leukotriene antagonist useful as anti-asthmatic, anti-allergic, anti-inflammatory and cytoprotective agent. Acebilustat is a leukotriene A4 hydrolase inhibitor, used for an oral antiinflammatory drug. Cilastatin is a renal dehydropeptidase-I and leukotriene D4 dipeptidase inhibitor.